Over 2 decades, Meghan and I had a chance to catch Chris Cornell 43 times, on solo tours, with Audioslave, Temple of the Dog, and Soundgarden. We tried to capture a small piece of the experience of each show, and this page is what we managed to bring back with us each time. On July 20th 2017, to honor Chris Cornell's birthday, we reached out to "Rock Bar" in Fort Lauderdale, FL to host a Chris Cornell tribute night. We took over the music for 3 hours and hosted about 60 fans to celebrate Chris's life and music. Most of our Soundgarden music and memorabilia is in a dedicated room now, so we’ve been posting progress pics every few months as we put more of it up and add more furniture. Meghan, Lea and I went out to L.A. for the Chris Cornell tribute. Soundgarden performed several songs including I Awake, Rusty Cage, and Drawing Flies with different friends guesting on vocals. Before Soundgarden came out, friends of Chris and his band(s) performed songs spanning his career, and Chris’s own performances were broadcast on the screens, with the last of the videos behind Soundgarden’s 2010 performance of “Beyond The Wheel” at their Nudedragons show. Tap the show link above to see our coverage of the show, including photos, videos of much of the tributes - including sets by Audioslave and Soundgarden members - as well as our original live Twitter/Periscope stream of the entire event. We saw Soundgarden perform 3 nights in a row on the Spring 2017 tour, which was a first for us. We were joined by the world famous Lea Maric (who is now a member of our Jeffgarden family) and made a road trip out of it. The 3 shows had similar sets but included Kyle Petty (Son of Richard) which they hadn’t played, at least since reuniting, and the previously-played-but-still-rare All Your Lies. Incessant Mace also became a show staple, and usually the highlight of the tour, and these shows in particular. In August of 2017, videography company Espo Productions posted their pro-shot video of the Fort Myers show, which we are incredibly grateful to have and share back with everyone on here, on the Toy Box page. We also have our own stuff posted as always, but the pro shot Fort Myers show is something you need in your life. While we’re on the subject of the Fort Myers show, we got to the show as Mastadon was about halfway into their set on the stage right beside the one Soundgarden would play on. We had already seen them the night before in Jacksonville so we were more focused on weaseling our way to the front for Soundgarden. We still had an entire Offspring set (Soundgarden stage) and A Perfect Circle set (neighboring stage) to go to get this done. Apparently…someone took offense to Meghan eventually making it to rail (we’re usually the ones on the rail for 10+ hours, so we get it, but whatever) so when she got a setlist at the end of the show, this dude grabbed it from her and had his wife stash it away. Lea was ready to throw down, as is often the case with Lea, but Meghan took the high road, told the guy he looked like Sammy Hagar mated with the Cowardly Lion (he did) and moved on, shortly before being handed a second setlist by event security who saw what went down. We had a chance to see Chris and hangout backstage for about 15 minutes before the show. You can see the setlist on a laptop and some of the Higher Truth gear that still has the European labels. The Austin show in 2013 was our first Chris Cornell “meet & greet”. We had all these questions though up - none of which we ended up asking. The session, which was supposed to be 5 minutes but was closer to about 15, had us and 1 other couple with Chris, with him doing most of the talking. Meghan and I had Jeffgarden.com shirts on so Chris joked that we already know everything and we probably didn’t have questions for him. The other couple asked him why he sings about dead birds/killing birds so much, and in true Chris form, he basically asked them what the hell they’re talking about, creating a nice, awkward few seconds, during which I never felt more at home in my life. We had taken a limited edition Badmotorfinger CD-holder thing to get signed, and the whole band ended up signing it, which was a very welcome surprise. Chris also signed a get-well card for Meghan’s brother Ben, and a setlist for our Knight friend Ian. Because there was no way we could get to the pit after our meet and greet ended, they let us watch the show from side-stage. Where we promptly began taking pictures and video - as one would expect from us by now. Nothing is cooler than wearing a Soundgarden shirt around town and having people come up to you and ask if they’re in town and actually know who they are. The Seattle show where the cover art for Songbook Volume 1 comes from, although you can’t really make out anyone in the front row. We had a photo pass for this show but just wanted to get up front so we didn’t use it (not that that stopped us from taking pictures). The venue was nice enough to mail us the pass a week later so we could have it as a souvenir. For some historic perspective, this was the night of The Apprentice finale. And also Bin Laden was killed. This was announced maybe 5 minutes before Chris came out so he probably didn’t even realize it as he played Ground Zero. We showed up to this show just before 8am, figuring that with it being his home town, there would be some competition for those rail spots. We also gave up DVD’s of stuff we had on the site to unsuspecting people in line. So for that, we apologize. We were able to sneak a few photos and video clips, including CC playing while cc plays air guitar sitting beside him. These photos and videos were shared the following day by the official Chris Cornell account via Team CC and by Toni on Twitter. We planned on attending PJ20 even before rumors started up that Chris would be making an appearance. We ended getting confirmation that he would be there when we heard his sound check the night before the show, when we were at the venue to pick up Mike & Jaye’s 10 Club tickets. Since this show was literally in the middle of nowhere, we ended up staying at the same hotel as a bunch of the band members. We had our birthday (Jaye’s) / anniversary (ours) dinner with The Strokes at the table behind us, and later met and hung out with Josh Homme of Queens of the Stone Age for a considerably long time. Queens of the Stone Age's tour manager gave us PJ20 press passes and our Temple of the Dog reunion videos ended up on Billboard and Rolling Stone’s websites the next day, and in 2016 were featured on the official Temple of the Dog box set. This link goes to our PJ20 page where we’ve collected our photos and videos from all the bands that played (or at least the ones we saw and photographed), as well as info about the Temple of the Dog Box Set with our videos, and their 2016 tour. 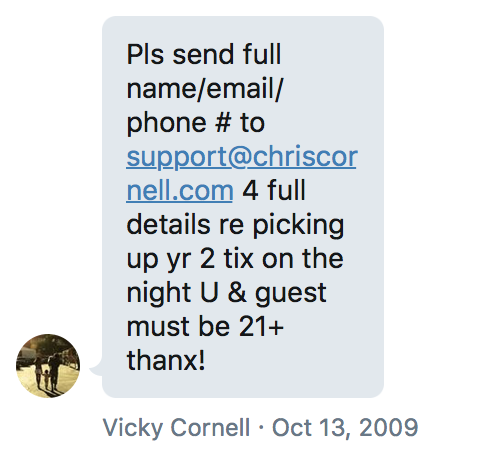 At exactly midnight, New Years Eve/Day 2010, Chris Cornell tweeted that the Knights Of The Soundtable ride again. Chris and Kim both stated later that this was meant to be an announcement of their new site, and their plan to have both a more prominent online presence and to have their back music catalogue and merchandise more readily accessible to existing and potential new fans. With Rolling Stone and others running with this and calling it a full reunion announcement - and the band doing nothing to dispel the rumors, but instead sitting back to observe the reaction - what started off as bad reporting ended up being a prophecy fulfilling action as Soundgarden did of course end up reuniting, putting out Telephantasm (and immediately shipping 1 million units with the Rock Band game thereby getting another platinum album under their belts), and going on tour. By the time they were confirmed for Lollapalooza, they had already played their first show, as Nudedragons, in Seattle, largely for members of the press and music industry. Their first Soundgarden shows would be coming up in Chicago. This Las Vegas show was for the grand opening of a new Hard Rock Cafe on the Las Vegas strip. Tickets were invite-only and we won a chance to win a pair of tickets from Vicky on Twitter. We were almost at the Fort Lauderdale airport when we realized we had left our paper tickets at home and there was no print-at-home option for the Chicago show. We managed to have someone (let’s pretend it was a cool friend in our building, like a Kramer situation, and not my mom) Fedex the tickets to us so other than a few years shaved off our lives from the stress, we ended up being okay. Plus, as a bonus, our Twitter friend Emily Wallen enlightened us to the fact that the Milwaukee show was just a rental car away, so we ended up adding that show last minute. We were close as you can get for that show. I’d say the closest we ever were for a Chris Cornell show just because we’ve had rail/front row before, but for this, there was no barrier to the stage. We’d actually have to keep moving our arms to keep from getting stepped on throughout the show. We actually got a few videos at the show, but being so close, the mic on our camera blew out. We did post a couple horrible-audio videos, and we put together a video with our own footage from the show, but with the studio audio for Preaching The End Of The World that synced up pretty nicely. The photos did come out pretty good though. Chris Cornell co-headlined Linkin Park’s Projekt Revolution after opening for Linkin Park outside the U.S. first. We caught 2 Florida stops. The first from fairly far away seats - which didn’t stop Chris from finding and pointing Meghan out of the crowd - and the second from the floor/pitt. Chester would come out to sing on Hunger Strike during Chris’s set, and Chris would come out later in the night during the Linkin Park set for Crawling. The Carry On tour had Chris touring with the guys from Run Through The Desert, and playing songs from his entire catalog, even including Temple of the Dog. These were the first 2 shows we went to with the new backing band, and I specifically remember thinking we wouldn’t have to worry about getting everyone in if we took any photos or video, but we immediately flipped on that once we saw the dynamic between the band and Chris. The opening band was Earl Greyhound and they were pretty good. They also brought out donuts for us after their set while we waited for Chris to get out. We took Meghan’s sister to the Fort Lauderdale show for her first Chris Cornell concert, and she came along - with Meghan’s brother also joining - for the Orlando show. At the Miami show, we had made signs that read "Real Activists Play Pretty Noose" as a dig on Chris Cornell essentially joining Rage Against The Machine. They were also playing Soundgarden songs at this point (Loud Love, Spoonman, Black Hole Sun (acoustic), Outshined) although we didn't expect they would actually play Pretty Noose because of the tuning and just because it's pretty likely the band hadn't learned it. So at the Miami show, Chris actually grabbed the sign from Meghan and read it, then tossed it off to the side. So, the whole point of creating the separate "What's Mine Is Ours" and "Toy Box" pages was to separate content that is directly from Meghan and I, and the stuff we've been sent or just come across online or from back in the day (VHS-rips and what not). This page is 1 exception, in that these band photos were part of the bootleg package of the show that Pearl Jam sells. So these are Pearl Jam's [management's] own photos and weren't taken by us. But we did go to this show, so we posted it on the What's Mine Is Ours page anyway. We each drove up about 5 hours from South Florida for this show and met after the show. I’ve been ruining her life ever since. After seeing Audioslave for my first and second time earlier in the year in San Francisco, the 2003 Lollapalooza brought them to us in West Palm, Florida. This was my cousins's first times seeing Audioslave & Chris Cornell. We only have a few photos up here but we do have a friend's bootleg video of the show on our Toy Box page. By the time Audioslave started touring, we'd already known them as Civilian for a couple years, and had heard their debut album - in demo form - for about as long. When spring break came up in 2003, I flew to San Francisco to catch 2 consecutive shows at The Warfield. Anyway, I had balcony seats for both shows, but because these shows coincided with the Iraq war (there was a literal countdown on CNN), the protests in the streets early in the day, the day of the 2nd show, had the venue's team letting us in early, at which time I just walked up to the rail. So I was able to have the March 20th show be my first rail-for-Chris-Cornell show.